Qualification has been recently introduced as a generalization of uncertainty in the field of Logic Programming. In this paper we investigate a more expressive language for First-Order Functional Logic Programming with Constraints and Qualification. 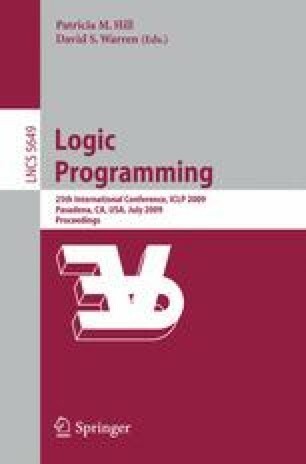 We present a Rewriting Logic which characterizes the intended semantics of programs, and a prototype implementation based on a semantically correct program transformation. Potential applications of the resulting language include flexible information retrieval. As a concrete illustration, we show how to write program rules to compute qualified answers for user queries concerning the books available in a given library. Research partially supported by projects MERIT–FORMS (TIN2005-09027-C03-03), PROMESAS–CAM(S-0505/TIC/0407) and STAMP (TIN2008-06622-C03-01).